As a mother, I am always after the welfare of my children. They are my world and I only want what’s best for them. Of course, I can’t always shield them from everything especially if the issue is about their health. Yes, I can always make them take vitamins and supplements but sometimes, the body’s immune system caves in rendering the body susceptible to viruses and diseases. I always try to make sure that my kids are kept safe from such but obviously, I can only do so much especially since these viruses are very much invisible to the naked eye. In fact, just this past week, I had to rush my son to the hospital after his fever shot up to more than 40 degrees! I couldn’t risk applying self medication to my youngest so I took him to hospital nearest our place. Well actually, there are 2 hospitals near our place but I chose to take him to the bigger one thinking he would be better taken care of there. When we got there, the interns in the emergency room took my son’s urine sample and after it tested negative, they told us we can go home already. As in seriously? My son was almost convulsive yet they were advising us to go home because they can’t see anything wrong with my son! It’s a good thing I exercised my right as a mother and I insisted that further tests be made. True enough, there was an infection detected on his blood. Anyway, long story short, we stayed for a couple of days in the hospital and my son is well now. But if we heeded their advice and went home that eventful night, I don’t know what could have happened. I don’t even want to imagine what might have been. One more thing that pissed me off was the incompetent nurses! Those on shift must check the IV and at least take a peek on his hand. 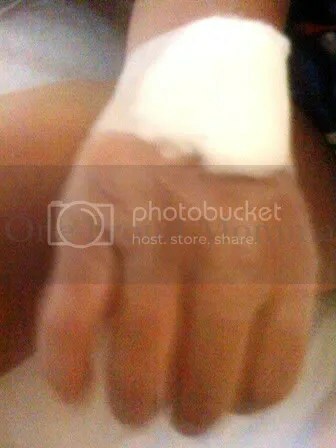 I guess they didn’t bother coz when the nurse took off the diaper on his hand, it was full of sweat and blood. Imagine, that was the same diaper from day 1 in the hospital! I wouldn’t have reacted so violently if it was easy to hire a lawyer here, pretty much like a Brooklyn Medical Malpractice Lawyer. But the thing is, it is so hard to acquire the services of lawyers here. Besides, I’m not even sure if there are competent malpractice lawyers here. I can vouch for those types of lawyers in the Brooklyn area and in other cities in the US because I always read good testimonies about them. But here? I am not quite sure. I’m just glad it didn’t have to reach that point and all’s well that ends well. I’m happy that all is well now. Haay,yup it’s frustrating sometimes. We had almost same experience too, they had to reinsert the IV several times to my 2 year old son then. Worst way to make him even more fuzzier. He was diagnosed and treated only to find out that we had to go back again because it’s wrong diagnosis! Best Regards! grabe naman kung san mang hospital mo sila dinala. parang SOP yung urinalysis and blood tests para macheck kung ano sakit. and dapat d nila pinauwi dahil mataas ang lagnat, buti na lang nga nag-insist ka. OMG wrong diagnosis tapos treated for the wrong one? aba’y if I were in your shoes eh nagwala na talaga ako dun and sued them! biktima din ang anak ko ng medical malpractice,naconfine sya na sugat lang sa paa ang sakit,pero namatay sya sa pneumonia,dahil di sya na x-ray bago operahan. Hi Nema.. Sorry for your loss. Meron siguro nangyare kaya nagkaroon sya ng pneumonia. Naitanong mo ba sa doctor baket nagkaganun? Cge icheck ko yang YouTube na yan.. May your kid rest in peace.. The truth is that medical malpractice occurs far more than people think.Hospital workers and doctors are people too, so they are all capable of making mistakes.